According to research released Thursday, Apple TV was overtaken by upstart Amazon in the U.S. streaming device marketplace during 2014, dropping Apple's offering to fourth place in a burgeoning sector it helped create. Market research firm Parks Associates in a report covering the U.S. streaming device market said Apple TV sales were overshadowed by strong performances from Roku, Google and Amazon. Roku again led the way taking 34 percent of all units sold in 2014, while Google came in second with 23 percent over the same period. Amazon managed to eat marketshare with its Fire TV and Fire TV Stick to push Apple out as a top-three contender. The four companies dominated what many believe to be a nascent industry, accounting for a combined 86 percent of all units sold to broadband households. "The market consolidation around these four brands forces new entrants to develop more creative features and functionality to tap into the strong consumer demand for streaming content," said Barbara Kraus, Director of Research at Parks Associates. "Devices with additional functionality such as the Intel Compute Stick may be a sign of things to come, where streaming is not the primary function but an extra feature to provide additional value." Streaming services are starting to gain momentum in the U.S. as some 20 percent of households with a broadband connection owned at least one such device. Interestingly, 8 percent owned at least one stick-type device, a cost-effective format made popular by Google's Chromecast and Roku's Streaming Stick. With an onslaught of new technology and competing service offerings, Apple is having a tough time moving its product last refreshed over two years ago. In 2012, Apple's device was in second place behind Roku, a position it would keep until 2014 when Google inched ahead with cheaper Chromecast hardware. Device sales tell only half the story, however, as usage rates yield insight into consumer trends and potential upgrade cycle performance. 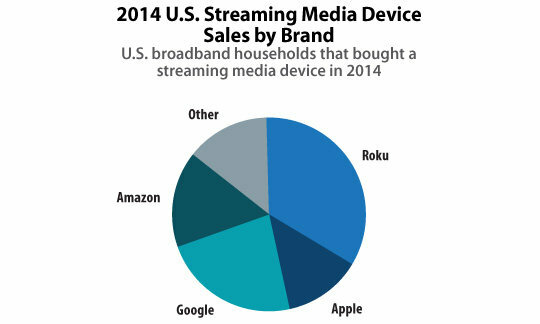 The most recent results reveal Roku as the most used device in U.S. broadband households with at least one streaming device. Google came in second with 19 percent usage rate, ahead of Apple TV with 17 percent and Amazon Fire TV with 14 percent. This last statistic suggests Apple TV owners tend to use their streamer much more than those who own Google or Amazon hardware. Apple is expected to release a new Apple TV revision with touchpad remote, dedicated App Store and Siri support in September. Also widely rumored is a bespoke over-the-top streaming service, though disagreements with content rights owners over licensing fees has supposedly forced Apple to delay launch into 2016.